Ask fellow campers about "Lake Pueblo State Park" and nearby attractions. This was a one-night stop on our way north. We stayed here to avoid higher winds further south, and it wasn't too bad here. We were the only ones in the campground besides the hosts. Pulled in just before dark, found a pull-thru that was long enough for us after noticing that the restrooms in all but the first loop are closed for the season, and got settled in. Walked over to the office with our check and envelope filled out and deposited it into the iron ranger. Kind of a lot to pay for an overnight stop with only electric, but we felt safe and secure and it was worth it. There are water spigots located about the park. The showers are in individual family-style rooms. We have the annual pass for Colorado state parks so we don't have to pay entrance fees. Totally worth it for us - and if you stay more than 10 nights it's a good deal. Kind of disappointed they've raised the rates on all the parks, but amenities cost money to keep up, and they do a good job. We disconnected so we could level the trailer, there was a bit too much slope to be comfortable otherwise. The picnic tables have wind shelters. 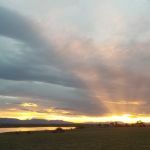 We camped at Lake Pueblo State Park in a Fifth Wheel. Beautiful park; handy to Canon City and Pueblo attractions as well as Fossil Beds NP. We camped at Lake Pueblo State Park in a Motorhome. There is very little shade at this park, so keep that in mind if you're trying to keep a motor home cool in the heat of the Pueblo desert summer. That is probably the only drawback to this wonderful state park. The sites are spacious near the outside edges of the park, and they are well maintained. It stays pretty windy, but it's tolerable (usually). The lake is awesome, and it's right in town so there is a lot to do just outside the park. 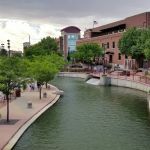 Definitely check out the river walk! Cell service is excellent, and the camp hosts are friendly. This is a boaters' park, so there will be a lot of traffic most of the day. We camped at Lake Pueblo State Park in a Motorhome. Only stayed one night, Juniper Campground, dry camping. Each site has a wind-shelter behind the picnic table. Seven dollars for a pass per day just to enter so rather a lot for a dry camp. Not very pretty but quiet. I had the campground to myself. We camped at Lake Pueblo State Park in a Motorhome. This State Park has electricity only. There is a covered picnic table and fire ring at each site. Sites are paved and some definitely more level than others. Pull through sites are long enough for our 40' RV with tow, though the driveway was almost too narrow. In planning your trip, if you make reservations online, add in $10 for the transaction fee and another $7 for the daily park fee when you check in. We paid a total of $41 for this electric only site; not a good value in our minds. Fresh water is available at the dump site. There is a water spigot in front of site 24, so I'm guessing there's others throughout the park. We would not stay here again. We camped at Lake Pueblo State Park in a Motorhome. A beautiful State Park -- usually quite busy. But during the week camping sites are available. We camped at Lake Pueblo State Park in a Motorhome. Loved the huge RV spots, some pull-through. Beautiful lake for fishing. Covered picnic tables at each site and a fire pit. Park very well-kept . We camped at Lake Pueblo State Park in a Motorhome. Take a trip up to the summit of Pikes Peak. Unforgettable. This is a state park without water or sewer hook-ups at sites. Is situated at Pueblo lake with most sites having a view of same. For the most part it is an excellent place to camp, however; some sites are not level and lack shade. Maximum amp is 30 with plans to provide 50 amp by the 2017 season. Restrooms and showers are very clean and well maintained. All major roads have been completely resurfaced....very nice. We camped at Lake Pueblo State Park in a Motorhome. There are marina's on both the North and South side with the South Marina being the more popular of the two. Marina's carry limited food items, drinks, ice and have an area for grilling/eating. Marina's also have boats for rent and fuel provisions. Local grocery and discount stores are within a 15 to 20 minute drive from the camp ground. We pulled in around 5 on a Thursday. There were a lot of spaces available on a hot July day. Our space had two large trees which provided shade over our camper but that is rare. We hooked up to electricity but no sewer was available. The lake was beautiful and calm and still, there was hardly any boats on it. I was longing for a boat of my own. There is a trail that goes around the lake if you just want a nice walk. We were interested in archery range because it was mentioned in another review but this is only a practice range with a few targets. The bathroom close to us was large with a shower, but there were quite a few bugs in it, gnats and silverfish. There was a flush toilet, so I don't really understand why our side didn't have sewer. The tent pads in the area are very nice, level, elevated, gravel with good drainage.for a barren type of environment, they have done well to create a nice atmosphere, trees have been planted and the sites are spread out and clean. We camped at Lake Pueblo State Park in a Motorhome. Pay attention to the park signage or you'll end up on the wrong side of the lake. The interior navigation of the park was a little tight for my 38' fifth wheel until we reached the reservation booth, after that it was fine. Arrived in pouring rain which changed to hail during setup - fun! Price includes site fee of $24 and park pass fee of $7. Sites are on the side of a hill overlooking the reservoir and are, mostly, not level. Otherwise, they're fine. Large with lots of room between sites. Electric was 30 amp only, no water or sewer hookups but faucets and dump station are available. OK for overnight but wouldn't do extended stay here. No shade but site picnic tables have covers. 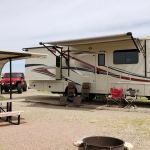 We camped at Lake Pueblo State Park in a Fifth Wheel. My only wish is that the One Way Drive thru loop was going the other direction. Our canopy and front door were opposite of our covered picnic table. NO OTHER Complaints at all. Fire pit, covered sturdy picnic tables. We rode our bikes around the park a few times. Every spot had a great view of the reservoir and the hills. Beautiful setting. Very well taken care of. Clean and friendly. 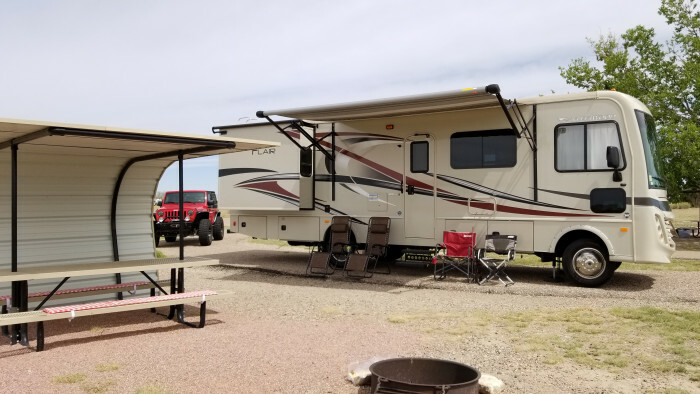 We camped at Lake Pueblo State Park in a Fifth Wheel. We rode our bikes around the RV park, and up one of the trails. We spent one day on the water. Close enough to Pueblo if need be. I was very disappointed in the pricing of this park. Let me begin by stating the site was OK, we barely fit but it was OK. We are a 50 amp rig, we had the 30 amp adapter and it worked OK, the 15 amp circuit did not work at all. The host told us it would take a week to get it repaired. The site was not level and it is somewhat a dog leg to the left. My issue is this is a State Park, we paid $20.00 for the site and then had to pay an additional $7.00 per vehicle. Therefore we paid for the bus and the Harley that was towed in a trailer. so in fact we paid $34.00 per night for very limited services! The showers are pay showers. We would have stayed much longer but decided to go to a RV park with all of the amenities, plus 50 amp service for much cheaper. By far the most expensive bare bones State Park I have ever been to. We camped at Lake Pueblo State Park in a Motorhome. 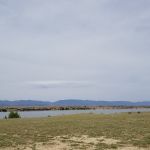 Lake Pueblo State Park has at least four campgrounds about the lake. We stayed at Northern Plains, which has widely separated paved sites and roads. 30 amp at site with a nice picnic table with a curved wind shelter. Scattered water faucets not close to the road. I didn't use the bathhouses but the one near us was dark without a light coming on. This is a dry windy high plains location by the man made lake/reservoir with a few sites by the lake. The lake is lower and surrounded by rocky bluffs. The campground is about 7 miles off the interstate, and only one sign at the interstate directing, with several turns making getting there confusing. We were overnighting and did not see the marina. We camped at Lake Pueblo State Park in a Motorhome. This could be a great place, but Colorado State parks has let it run down. I will mention a few good things first. The RV spots are close to the reservoir, quite large with many being pull through. Nice is a very nice marina on the reservoir. It seems obvious that the owners (not government employees) of the marina care, because it seems most everything they controlled was in top shape. The campground in another story. Our electrical box was broken and while the attendant said she would contact maintenance, no one ever came. The doors in the men's washroom stalls were broken and the dump station had a type of nozzle that wouldn't allow clean outs, only hose down of spills. Most of the trees were dying, even though there is plenty of water in the reservoir. There are many nice park in Colorado, but this is not one of them. 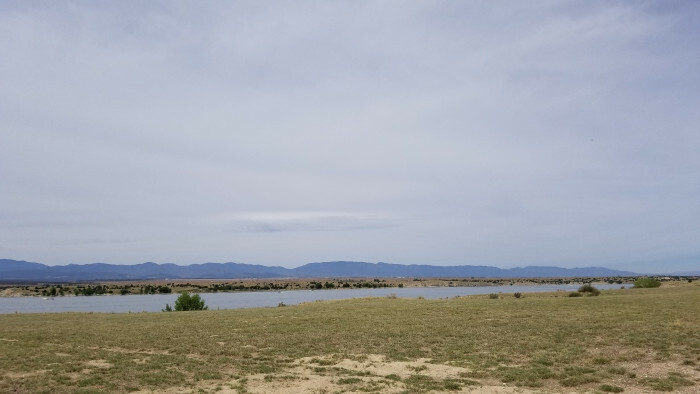 We camped at Lake Pueblo State Park in a Fifth Wheel. This park did not receive a "10" because it has pay showers, as do most Colorado parks. They did have a new hot water heater and I really think my $.50 lasted longer than three minutes. This is desert camping, but close to the expressway. There are plenty of pull through sites. Our intention was to just stay one night, but we were enjoying ourselves so we stayed three. It is well worth it to buy a Colorado state park pass, though you must buy one for both your RV and towed vehicle. True, you cannot hook up to sewer or water, but there are plenty of spigots and the spigots are threaded so you can hook up the hose to fill your tank. The wind blew strong, but I washed clothes in the excellent , reasonable laundry and hung them on the back of the rig to dry in about an hour. We camped on the weekend, but nobody was rowdy. The lake is very low, but plenty of people enjoyed it. Nice trails and bike path. We had shelter over picnic tables. I found the staff and volunteers very helpful. We camped at Lake Pueblo State Park in a Motorhome. Are you affiliated with Lake Pueblo State Park ?